Foster + Partners has unveiled plans to surround its extension to the Norton Museum of Art in Florida's West Palm Beach with a subtropical garden, to provide "outdoor galleries" for sculptures. The British firm, led by architect Norman Foster, will create its first public garden as part of the renovation and extension of the museum on Olive Avenue, set to complete in February 2019. The garden, which will replace an asphalt car park on the southern side of the museum, will be filled with 272 trees and shrubbery to create a public space shaded from Florida's harsh sun. Native trees will form walls around different areas occupied by 11 sculptures donated by Pamela and Robert B Goergen. Walkways will link each, which Foster describes as "the equivalent of corridor spaces connecting outdoor galleries". "The museum has important works of public art of sculpture, but has never really had the opportunity, or the ability, to be able to embrace fully the local landscape and create outdoor spaces," said Foster, while unveiling the design during a press conference at his Hearst Tower in New York today. "We're thinking about how landscape can create a series of outdoor rooms," he continued. "Once you get the vegetation and the evaporative cooling you can make this a very comfortable environment. " 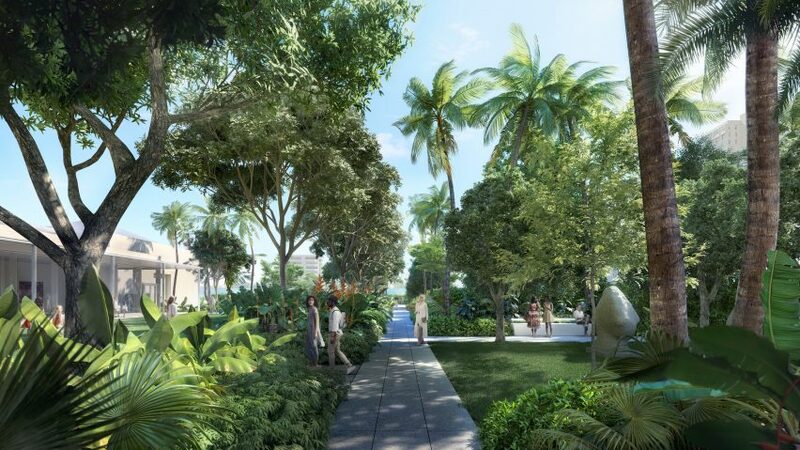 Foster + Partners' landscape architect Neil Bancroft selected the vegetation to suit Florida's subtropical climate, harsh winds in hurricanes and lack of water in drought season. Eight swietenia mahagoni trees, also known as West Indian mahogany, will be transferred from the south of the state, while other species will include gumba limbo trees, which Bancroft says has a "shiny red bark", and false tamarind that create reflections like "a bit like water on the ground". Bancroft intends the tree canopies to grow big enough to provide shade for the public to enjoy a dining area in the garden. The canopy will also shelter non-native vegetation, which he plans to add a pop of colour. "Underneath these trees and with that shade we can use a variety of plants both native and non-native," said Bancroft. "We've honed into something about texture, about greenery with the occasional flash of colour, which is in oranges and white." Foster + Partners' addition of the greenery forms part of its "museum within a garden" concept for the transformation of the site, which it first unveiled in 2013. The design will add a new 59,000-square-foot (5,480-square-metre) wing housing an auditorium, great hall, an education centre. The building will be topped with a huge roof that curves around an 80-year-old Banyan tree growing on the site. Work began on the project in 2016, and the structure topped out in June this year, just before the site was hit by Hurricane Irma. The firm said that the site received minimal damage and the Banyan tree also survived. Foster + Partners' other plans for the museum include renovating six 1920s houses to the south of the garden, to create artist residences and a home for the museum's CEO Hope Alswang. The firm, which Foster founded in 1967, has recently completed Bloomberg's European headquarters in London and an Apple Store in Chicago with a roof shaped like a giant Macbook.